Does it come as a surprise that India are winning a bilateral one-day series at home after more than three years?We haven't played well in one-day competitions for a while. I'm not surprised in the sense that I believe in this squad. Even in Sri Lanka we lost against them but all the three games were close. People forget that. We had opportunities to win in all three games. If someone had said at the start of the series [that we would win 4-0] I might not have believed him. But after the first couple of games I believed that we could wrap this up as quickly as possible. To be honest we haven't been playing good one-day cricket after the World Cup [in 2003]. Some of the teams have showed us up in one-day competitions in India, and abroad as well. What has made the difference? I just think that many guys have played a lot better individually, taken up the responsibility and performed better in their roles. There's been a bit of freshness in the squad which has definitely helped. Greg [Chappell] and Ian [Frazer] have come in and helped a lot in that direction. How different is it being captain of India, from just being stand-in captain? It was just nicer to get the job over a slightly extended period. I've never really thought that I am just a stand-in captain so I should do things differently from when I was actually captain. But having the job over a period of time does help - not just me but everyone in the squad - because you know you're going to be in charge for a while. That adds a bit of continuity. It helps in getting your message across. Were you disappointed or hurt going into Zimbabwe? Not really. No, I don't dwell on these things too much. I've been dealing with being selected and being dropped from the age of 15 when I got involved in competitive sport. At the end of the day you have to realise that in a team sport other people make decisions on whether you're playing or not. You can't dwell on those things too much. You have to concentrate on the cricket, try and get over it. I try to focus on the positives, what I have to do, and not necessarily on what has happened. Would you rather have been told earlier? Not really. I would not like to make too many comments on that. At the end of the day I don't make decisions on whether I'm going to be captain or not, or whether I'm going to be in the team or not. That's a fact of life. That's part of team sport. If you are going to play at the international level you have to accept those things. Sometimes things could have been done differently and sometimes not, that's a matter of personal opinion. There's been a suggestion that you said you would not accept the captaincy unless it was given to you over a period of time, and that you made this clear to the board president ...Absolutely not. I don't think there's any truth to that. The board president never spoke to me before I was appointed captain and I had no such conversation. The team looks good now and there's been a lot of talk about the team spirit ...We have been winning games and then the spirit is always high. When you have a lot of performers in the team that makes a difference. You can't discount the fact that winning makes you look good. If we lose a few games everyone will be saying the same squad of boys doesn't look good. I don't get too carried away with that. Winning has helped. Different people performing when we needed it has helped. It's early days yet. There's no point getting carried away yet. But what I'm really happy about is not that we've won, but that we're working really hard, and we're preparing really well for every game. We should not get too carried away by these wins. These wins will keep happening if you keep the preparation going. You put a lot of stress personally on preparation before a game. How has the support staff [coach, Frazer etc] helped make a difference with reference to this in the team context? They have helped a lot. Greg and Ian have brought in some new ideas. They work really hard on preparing the guys to play a game of cricket and once we reach the field it is my team and I lead the boys. Greg and Ian have prepared the team brilliantly. John [Gloster] and Greg [King] have played their part well as physio and trainer. Ramki as analyst, and a good manager in the Wing Commander [M Baladitya] has helped immensely. It's a coming together of good people. It's an environment where we're challenging each other constantly. That is helping. I'm enjoying the environment and I'm sure the rest of the boys in the squad are enjoying the environment. We've seen, one way or another, that the captain-coach relationship is an important one. Tell us a bit about your relationship with Chappell. It's important to have a good coach-team relationship. It's not so much about coach-captain. I think the success we have had has been down to guys in the team knuckling down and performing well. You have to realise that without a good squad of guys, without a performing team, there's not much a captain or coach can do. As captain, or coach, there are certain things you can do to make a team better, but there's a limit to that. At the end of the day players have to perform. The credit should go to the people who perform - you can have all the theories you want, all the field placings you want, but if someone does not put the ball in the right areas or do the job with the bat, nothing else matters. The coach and captain have a definite role to play in providing a good environment, but the credit should go to the guys who do the job. You've always put a bit of importance on leading by example. How important is it for you to set an example in the way you prepare, conduct yourself, perform? I think you have to. You have to lead by example. That's the way I have tried to do my best for the team. As a captain, if you expect guys to work hard, always to their best, become better cricketers, then you have to show them that you are trying constantly to do that yourself and challenging yourself. I'm sure the guys pick up on that. I'm sure the guys see that you're not just saying things but actually practicing what you preach. You've emphasised a lot on processes and not just on results. But assuming the results are not going your way, does the team have the maturity to still believe it is the processes, not the results, that are important? Not always. At the end of the day we are playing in a sport where results are everything. But that's where you are going to be tested. Are you willing to back yourselves when it's not going well? There are times when it is not going to go well. When things are not going well you have to look to change things and be a bit proactive about it. Not everyone is going to have the patience with us when things are not going well, but we must have that patience as a group. We must have some patience with some of the boys when things don't go so well with them. It's been suggested that you might have some trouble dealing with the difficult characters in the team. How has it been dealing with a mixed group of individuals? It's been very good. The guys have responded well and everyone has been solidly behind the team, more than anything else. I have had no problems, no issues. I have been around a bit, you know. I've played with these guys for a while. I know them well. I didn't ever think there was going to be an issue with this sort of thing. Recently there has been a lot of talk about the role the seniors play. How has the whole mentoring bit worked with people like yourself and Sachin [Tendulkar]? Sachin plays a very important role because all of us look up to him. He is one of our senior guys. It makes a lot of difference to have someone like him around, someone who is willing to make a difference, to help, to contribute. Everyone can learn from him, whether it is at a team meeting or just having a casual conversation at the end of the day's play. It is important for us to create an environment like this where some of the senior guys can play a role like this. Greg [Chappell] and Ian [Frazer] have been instrumental in doing this. Being captain of India is not just about cricket. You have to deal with officials, endless press conferences ...You have to deal with it. That comes with the terrain. I was lucky that I was vice-captain for four years and I learnt how the system worked. I got a lot from sitting back and seeing how things worked but it's early days yet. I have not led the side enough to tell you what it's like. Irrespective of whether the team wins or loses, it is too early for me, or others, to form an opinion on what sort of captain I am. I have led the side in just 20-odd games and that is not enough experience given the amount of cricket we play these days. 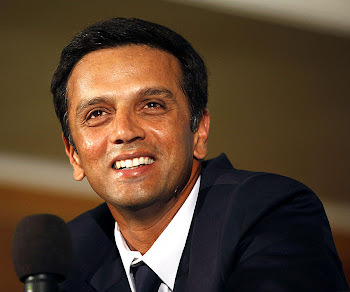 You took over at a troubled time for Indian cricket. How did you deal with that? We try to focus on the cricket. We try to impress on everyone that cricket is the most important thing and that the rest is not so relevant. We try and ensure that working, sticking to routines and things like that are the most important. It's all very well saying you have to focus on the cricket. But how easy or difficult was that phase for you personally? It's not that difficult either. There will be different phases in your life when you have to face different challenges. At the end of the day your focus has to be that you play the game because you love it. You have to bring that enjoyment into what you do. Also, sometimes you have to tell yourself not to take things too seriously. In India it is easy to make the mistake of taking things too seriously. Everyone is jumping up and down about us winning the series [against Sri Lanka]. Yeah ok, we've done that, but we have to stop thinking about that and move on. If we lose people will moan. As a player you have to realise that you are there to do the best you can at a game you love playing. That's all I can ask of guys in my team, and that's all I can ask of myself. The way you're batting in one-day cricket these days, is that also a reflection of the fact that you're not taking yourself so deadly serious these days? I've learned to accept success and failure equally. It's not just now. I have learned to deal with it and be on an even keel over the last five years. That has been a huge help to me as a cricketer and as a person. That comes from experience. I was dropped from the side for about a year in 1998, and I realised that one of the things I missed was the enjoyment of playing the game. Sure you enjoy the successes, but you also learn from the failures. I tried to bring the enjoyment when I came back. And I guess it also taught me that life would not end if I was not picked to play for India.